The thing is, bacteria grow and divide pretty rapidly. As they divide, they replicate their DNA, ensuring that there’s one copy for each of the two daughter cells that arise from division. Unfortunately, replication is not 100% accurate, so some genetic changes are liable to occur in the process. If one of these genetic changes enables the bacterial cells to fight off an antibiotic, then that bacterium and all its daughters will become resistant to that drug. For example, Klebisella pneumoniae, which causes pneumonia, has evolved to produce a chemical that breaks down the antibiotics used to treat it. The broken down drug is useless, and the bacteria thrive. To make things worse, once a bacterial cell has acquired antibiotic resistance, it’s more than happy to spread the wealth to other species, in a process called horizontal gene transfer, which means exactly what it sounds like – bacteria are able to transfer their genes to their neighbours. In the past, our approach to dealing with this has been to move onto another antibiotic. But over time, bacteria find ways to combat each drug, and so an evolutionary arms race develops. So what should we do? This problem has been on the horizon for many years, but a dearth of specific governmental funding coupled with a lack of enthusiasm from pharmaceutical companies has meant that the number of available antibiotics has been on the wane, with only two new classes of antibiotics discovered in the last 20 years, and resistance increasing all the time. The key to cracking antibiotic resistance might be to step outside of the box, and think of alternative ways to combat drug-resistant bacteria. After all, there’s more than one way to skin a cat. Here are three ways this particular cat is taking a hit. So, the bacteria you need to kill have evolved a way to bully your antibiotic into submission. The solution? Fight back, bringing some friends to help you out. That’s exactly what scientists in Canada have found a way to do. They studied over 500 naturally-occurring compounds with all sorts of origins, to see if any of them could restore the ability of one antibiotic, meropenem, to kill drug-resistant bacteria. The bacteria in question, E. coli, break apart a crucial section to the antibiotic, rendering it useless. Out of 500 products, the authors found one — an extract from a fungus — that could stop the bacteria’s resistance mechanisms from working and so make the bacteria susceptible to antibiotics again. Now, 1 in 500 isn’t exactly a high hit rate, but when you’re talking about humanity’s last line of defence against total meltdown, it’s way better than nothing. It could be that screening for other products that come to the aid of antibiotics like this fungal friend might be a useful way to prolong the lifespan of the drugs we’ve already got, while other people get on with trying to discover more, sharpish. Way back in the early 1900s, before antibiotics had been discovered by Dr Penicillin (nee Fleming), doctors used a different technique for combatting bacteria. Viruses called phages specialise in killing microorganisms, and have been used for over 100 years in some countries where antibiotics aren’t readily available (for example in parts of the Soviet Union). The viruses puncture the bacterial cell’s outer layer and inject DNA into the cell. Production of the cell’s normal proteins is suppressed, in favour of phage proteins, allowing new phages to be assembled, which then burst from the cell, tearing it apart before heading off to infect more cells. 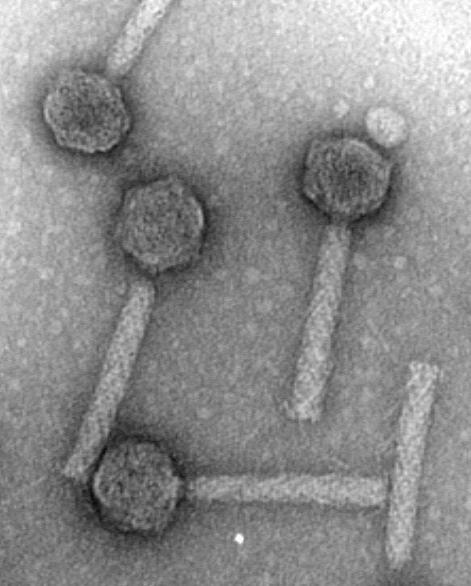 Although it might sound counterproductive to use a virus to fight disease, phages are harmless to humans, targeting only specific bacteria. In fact, this very specificity (each type of phage infects only one type of bacteria) is the reason that antibiotics, which can be used to treat many different types of infection, were considered to be better option. But now scientists are returning to the idea of using these viruses to treat infection, with a pilot project underway in Europe. 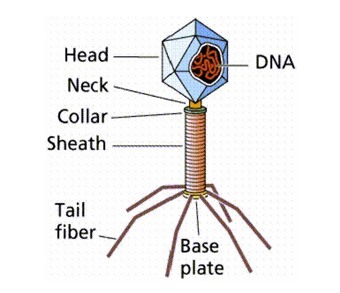 The very specificity of the phage for a particular bacterium makes it an attractive tool to use, because it won’t affect all the beneficial bacteria that have set up home in the body. In the short term, this prevents the side-effects associated with some antibiotics, but there is an added long term advantage, because killing all the good bugs makes it easier for bacteria that have evolved antibiotic-resistance to thrive. And scientists hope that, because of the HUGE numbers of different phages out there, becoming resistant won’t be a problem — you simply find a new virus that kills the bacteria and add it to your drug cocktail. So old and new friends might help see us through the crisis, but wouldn’t it be great if we could just find some more antibiotics somewhere? Step up, synthetic biology. SynBio, as the kids call it, is a branch of biology the aim of which is to manipulate biological ‘parts’ – genes, proteins, cells – to create living organisms with new functions (I wrote an excellent blog about it once, you should definitely read it here Synthetic biology, playing God or just plain odd). And because most antibiotics are put together by several different proteins that act towards a common goal, it seems logical that by changing the combination and/or structures of these proteins, you can make new antibiotics. Kind of like changing accessories to transform your outfit from work-appropriate to party-animal wear. Synthetic biologists have taken several approaches to this. For example, one group have altered the nature of the ‘carrier protein’ that guides the antibiotic, holding its hand as it travel along its production train. And just this week, one group announced that they have synthesized a version of the cell’s protein-producing factory, a structure called a ribosome, in a test tube. Lots of the antibiotics we use target the ribosome, stopping the bacteria from making the proteins they need to perform at their best. So, their research should help us to develop a more in depth understanding of how the ribosome is put together. If we know this, the thinking goes, we can design antibiotics to stop it being assembled properly in the first place. Now, to be clear, neither of these steps have yet led to the production of new antibiotics. But the future looks bright for this particular research avenue. These three approaches are great — for now. As with the antibiotics, bacteria will eventually evolve to be resistant to these therapies. And so the arms race will continue. This entry was posted in New research, science and tagged adjuvants, antibiotic resistance, phage, Synthetic biology by allinthegenes. Bookmark the permalink. So is a phage a c3po or a Chewbacca?And who is an Ewok? That looks like an amazing exhibition, I’ll have to go check it out. Thanks!